Should we always oppose military coups? 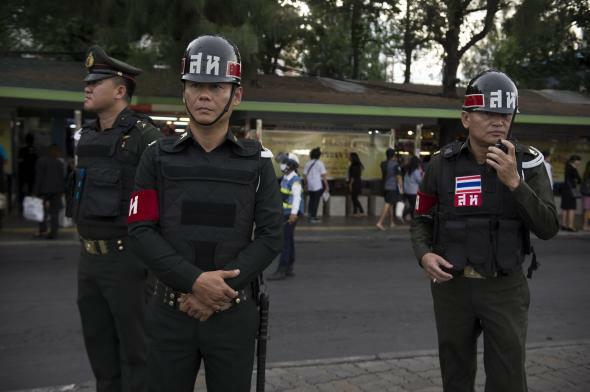 Thai army police officers secure an area at Victory Monument on June 5, 2014, in Bangkok. As I’ve written recently, it’s been a big year for coups, alleged coups, and coup-installed governments. The U.S. policy on coups is understandably hostile, with law preventing foreign assistance to governments whose “duly elected head of government is deposed by military coup or decree.” (This law is one reason that U.S. officials are often reluctant to use the word.) The Organization of American States and the African Union have similar anti-coup rules in place. But is our kneejerk opposition to military coups misplaced? We can all agree that coups overthrowing democratic governments are never good, but what about authoritarian ones? The economist Paul Collier has made that argument, suggesting that “the very forces that sanctimony comfortably condemns can sometimes be the most effective ally of democracy.” After all, whether or not a dictator survives often depends more on the support of those around him than the support of citizens. 2014 also marks the 40th anniversary of Portugal’s “Carnation Revolution”—probably history’s most famous “good coup”—in which António de Oliveira Salazar, Europe’s longest-ruling dictator, was brought down by an army officers’ revolt, leading to the country’s transition to democracy. In general, coups have been much more likely to lead to a return to elected government since the Cold War. Thyne and Powell argue this is in line with the incentives juntas face after taking power. The biggest threat to these governments, after all, is often another coup. To head this off, they can attempt to “coup-proof” their regimes by weakening the military while strengthening their personal forces—as Muammar al-Qaddafi did with disastrous consequences—or allow a transition to elections. In general, though, I think it would probably be wise for the U.S. to maintain a general bias against supporting coups. The U.S. record of choosing military leaders to support is pretty wretched. And even when coups lead back to democracy, countries tend not to have just one. As we saw in Turkey and Thailand throughout the 20th century and Egypt more recently, countries can become trapped in coup cycles. Democracies that live by the gun also tend to die by it.